​Stay in the loop with all things AAFMCC. 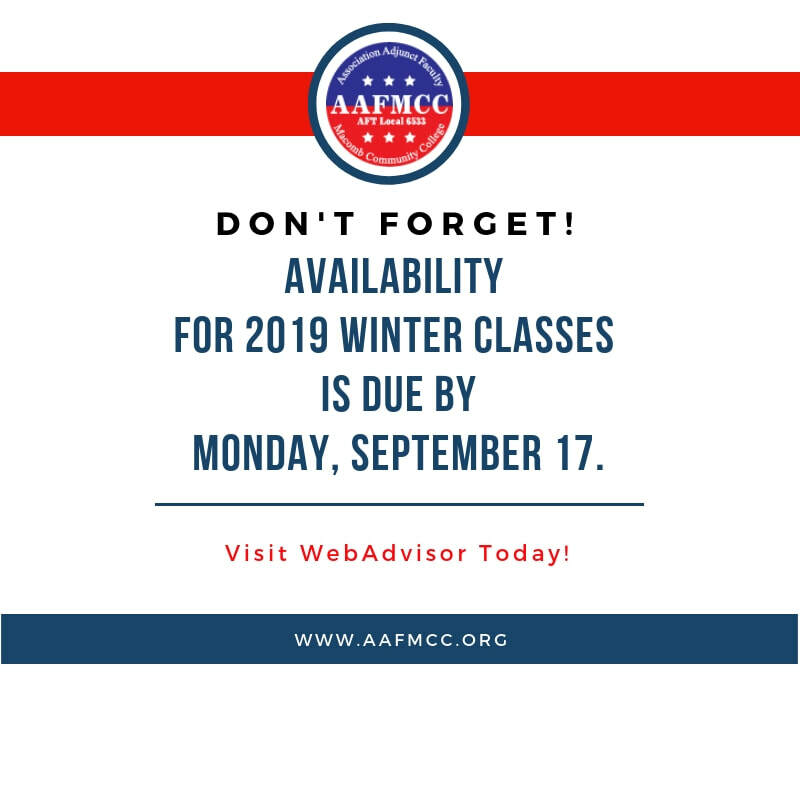 As of November 2018, AAFMCC is no longer using MCC email to communicate with members. 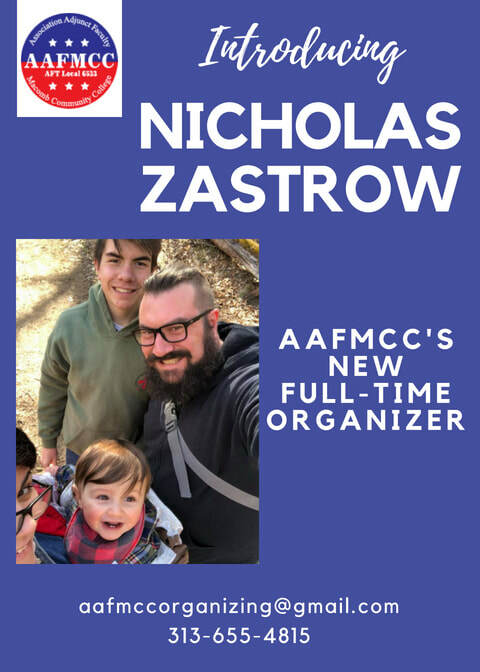 Instead, we will be using our members' personal email addresses to send out availability reminders, bargaining updates, and other important AAFMCC information. If you are not receiving AAFMCC communications to your personal (non-MCC) email account, then please take a minute to complete this form. 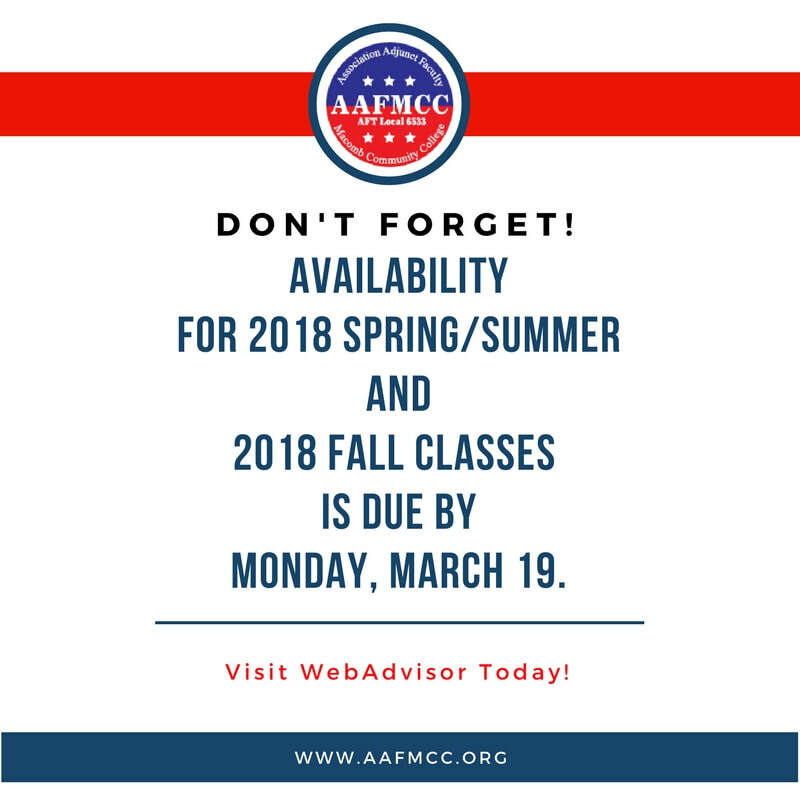 AAFMCC's Tuition Reimbursement Program (TRP) is currently suspended because we have exhausted all of the TRP funds that were allotted for the 2013-2018 contract. We hope to reinstate the program as soon as we secure a new contract and receive additional TRP funding from The College. AAFMCC encourages members to vote for Eugene Groesbeck for MCC Board of Trustees on November 6. Eugene is supportive of AAFMCC, and he has demonstrated his support by standing in solidarity and joining AAFMCC at our Informational Picket on Oct. 19 and at the Board of Trustees' Meeting on Oct. 23. Hello, I am a candidate for the Macomb Community College Board of Trustees. This isn't the first time I've been a candidate for the MCC Board of Trustees. In fact, I've campaigned for the office on numerous occasions in the past. I am a strong advocate of MCC and its mission having graduated from MCC in 1979. I'm fond of saying MCC is where I discovered my brain. Also, my family has deep ties to MCC as my late uncle, Harvey Groesbeck, was a charter member of the Board of Trustees. I am retired from the Macomb County Sheriff's Office where I worked for twenty five years as a Corrections Deputy. While employed at the sheriff's office I was very active in the Macomb County Professional Deputy Sheriff's Association, the union representing the uniformed staff of the department. I served as steward, vice-president and president of the organization. As such, I was intimately involved in collective bargaining and employee grievance issues as well as representing our members in disciplinary proceedings. I also have a proven track record of community involvement as a volunteer mediator with the Resolution Center in Mt. Clemens and a member of the Foster Care Review Board in Macomb County where I currently serve as chairman. Since retiring from the sheriff's office in 2014 I have been a Special Investigator with the United States Department of State Diplomatic Security Service where I conduct employment related background investigations. In addition to being a graduate of MCC with a Liberal Arts Degree, I also have a Bachelor of Science Degree in History from Lake Superior University and a Master of Arts in Conflict Resolution from Wayne State University. I believe that my education, employment history and volunteerism in the community make me uniquely qualified to be a member of MCC's Board of Trustees and hope you agree. I have been endorsed by three MCC employee unions: the Association of Adjunct Faculty of Macomb Community College(AAFMCC), AFSCME Local 2172.15 & AFSCME Local 2172.16. I have also been endorsed by the Metro Detroit AFL-CIO. I would very much appreciate your vote on the non-partisan section of the ballot on November 6th, which is coincidentally my 59th birthday! If I can answer any questions/concerns relating to my candidacy please don’t hesitate to ask! PS: Please share this with your family and friends. Word of mouth is very important in a campaign such as this. Thank you! !